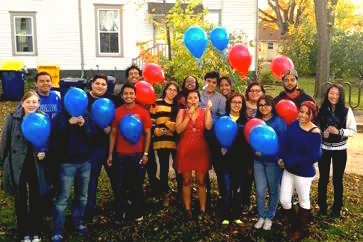 LASO, also known as the Latin American Student Organization, is an organization originally established to provide peer and cultural support for students of Latin American descent and background. Although LASO still provides a supportive and comfortable environment for Latino/Hispanic students, the programming and organization have evolved with the intent to encompass the entire Carleton community. We encourage students from our community as well as others to participate and create activities that enrich the understanding of our history, culture, and issues. Can you come to our events? Of course you can! All LASO events and membership are open to the entire Carleton community. Come by yourself, with friends, to make friends- more importantly, come to learn about the growing Latino/Hispanic population on campus! As in many of our cultures- the more the merrier! Click here to get updates on meetings and upcoming events. Meet your 2015-2016 LASO officers. Find upcoming events and relevant programming. Find out what members think about LASO. Pictures from LASO events and meetings. Get emails about upcoming events and meetings.